Do you have excess inventory of New or Used Spectralink Wireless (WiFi or DECT) Telephone Handsets you no longer need and want to sell? NetEquity.com is a leading buyer of used and excess Spectralink Wireless Telephones, batteries, DECT Base Stations and other accessories. If your company has recently completed a wireless phone system upgrade or migrated to a new wireless handset vendor, contact our purchasing staff today for a fast, competitive quote to purchase your excess inventory of Spectralink WiFi 84 or DECT Series handsets. Spectralink Wi-Fi and DECT Wireless enterprise handsets offer HD voice quality, durability, wide platform interoperability, and Spectralink VQO (Voice Quality Optimization). Spectralink UC software integrates seamlessly with all major SIP call platforms including Microsoft Skype for Business®, Cisco Unified Communications and others. Spectralink mobile wireless handsets deliver high-quality, secure communications to meet the needs of mobile workers in industries such as Healthcare, Retail, Manufacturing and Hospitality. NetEquity.com Buys, Sells, Trades and Consigns Spectralink Wireless Telephones. If you are an equipment seller or potential buyer interested in pricing, we can help! Contact us today for a quote. Looking to Buy New or Refurbished Spectralink Wireless Handsets or Accessories? NetEquity.com maintains a large inventory selection of New and Professionally Refurbished Spectralink wireless phone models and accessories. To get a price quote, simply contact a NetEquity sales representative today via phone or web form and let us know the quantity and condition of telephones you are interested in. We will provide you with a competitive quote and fast turnaround to meet your network and budget requirements. NetEquity Refurbished Spectralink Telephones are professionally remanufactured to Grade A Cosmetic Condition, fully tested by technical staff and reset to Factory Default settings. Our Refurbished Spectralink phones include are ready to install out of the box. In addition to offering extremely competitive pricing on Refurbished Spectralink Phones, we also offer a full 1-Year replacement warranty for End Users on all Refurbished Spectralink products. We also maintain a very large standing inventory of the most popular Spectralink Wireless models and accessories, ensuring that we have what you need IN STOCK, with no long lead times. NetEquity.com can usually ship your Spectralink Wireless Phone order same-day, and can fulfill time-sensitive equipment orders or hard-to-find Spectralink products on short lead times....ensuring you get the hardware you need to complete your projects and stay on track with your busy schedule. We support delivery via most major carriers including Fedex, UPS, USPS Priority Mail and DHL. We also provide logistical support, timely tracking, Blind Drop Shipping and product fulfillment. Tired of waiting out long delivery timelines on Spectralink Gear with your current IT/Networking equipment hardware vendor? We can help! NetEquity.com wants to buy your used, excess or end-of-life Spectralink Wireless Phones. 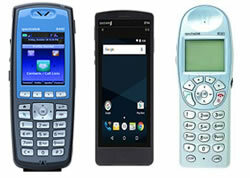 If you've simply outgrown your Spectralink Phones and are interested in a trade-in or upgrade, we can help. Contact us today to sell, consign or trade your unwanted Spectralink wireless telephone equipment. NetEquity.com is not affiliated with Spectralink Corporation or any other manufacturers. Spectralink® and the Spectralink logo are trademarks or registered trademarks of Spectralink Corporation in the United States and certain other countries. All other trademarks are trademarks of their respective owners.